These eye-catching earrings from the Swedish jewel vault happen to be impressive on both the diamond scale and the historical scale, like many other items in the family collection. Their rose-cut diamond teardrop frames are particularly reminiscent of a versatile pair of earrings in the British collection, but the Swedish version features more detailed pendants with briolette diamonds dangling inside. The Vasa Earrings were a gift to Princess Victoria of Baden (1862-1930) when she married the future King Gustaf V of Sweden in 1881, but that was not their first connection with Sweden. The earrings are said to have been associated with Frederica of Baden (1781-1826), wife of Gustaf IV Adolf. He was forced to abdicate in 1809 and the earrings left Sweden too, until Queen Carola of Saxony (granddaughter of Gustaf IV Adolf and Frederica) gave them to Victoria for her wedding. Members of the Vasa dynasty were early rulers of Sweden, and Victoria was a descendant of the house. The earrings have remained in the Swedish royal family ever since, and have been worn by several family members both with and without the pendants (though I think they look a bit, well, empty as plain frames). 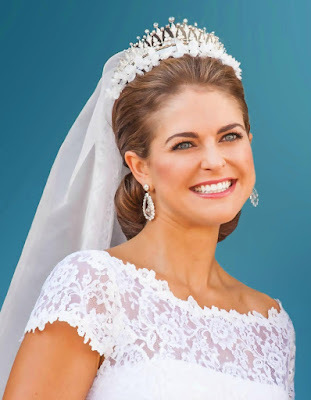 Princess Madeleine has given these earrings their greatest showcase in recent years, wearing them for events such as Crown Princess Victoria's pre-wedding dinner, Prince Carl Philip's wedding, and at her own wedding. They must be heavy to wear and they aren't favorites of Queen Silvia or Crown Princess Victoria, so I always cheer a bit to see Madeleine take them out for a spin. They're big and delicate all at once, and their history deserves to be shown off.